River King Newfoundland Club welcomes all those with an interest in purebred Newfoundland dogs. The club currently has a roster of close to 100 members, with our membership mainly in Central and Southern Illinois and East-Central Missouri. 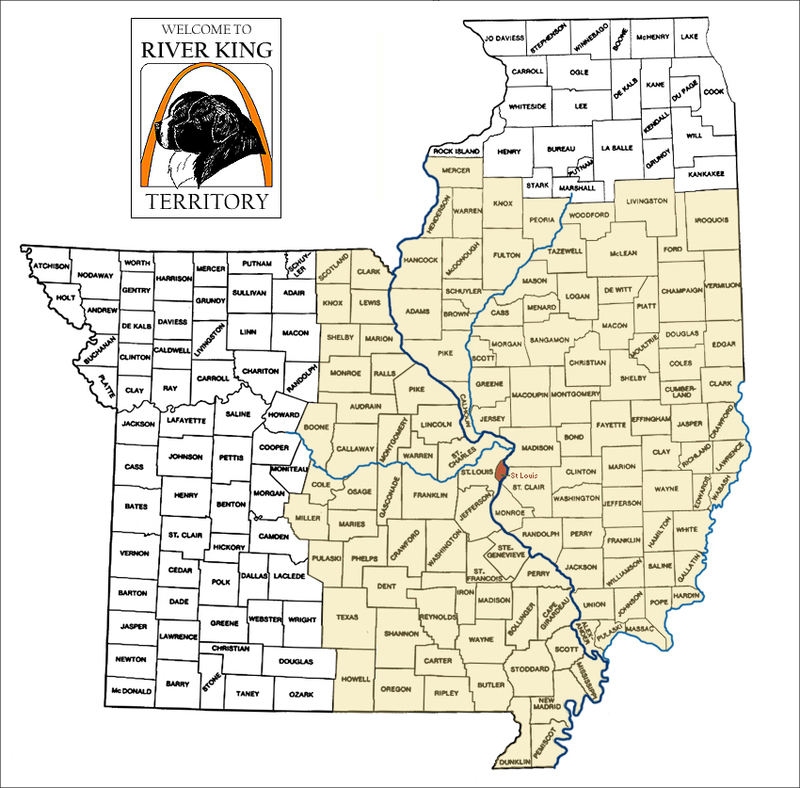 The region represented by the Club is all counties of Missouri east of and including the counties of Scotland, Knox, Shelby, Monroe, Audrain, Boone, Cole, Miller, Pulaski, Texas and Howell, and all the Illinois counties south of and including the counties of Hancock, McDonough, Fulton, Peoria, Woodford, Livingston, Ford and Iroquois. For a map of the club region, click here. This class is for individuals who have applied for membership, or are family members of a family group applying for Family Membership, who have been approved by the Board of Directors and are bona fide residents of the region of the Club. This class is for individuals who have applied for membership, or are family members of a family group applying for Family Membership, and have been approved by the Board of Directors but who do not reside in the region of the Club. This class is for individuals who shall not have attained their eighteenth birthdays. They shall hold all rights, duties, and privileges of general membership, except that they need not satisfy the minimum attendance requirements for application and acceptance into the Club and shall not be eligible to vote or hold office. This shall shall be conferred by the Board of Directors upon a majority vote of the Board. The Board shall consider the following in its determination of Honorary Membership status: distinguished, long-term service to the Newfoundland Dog or the fancy; a single extraordinary act; public status and activity that conduces to the welfare of dogs. Honorary Members shall hold all rights, duties and privileges of general membership. They shall be ineligible to vote or hold office and shall be exempted from the payment of dues. However, if they have fulfilled the requirements of general membership they may retain the right to vote and hold office if they live within the region and pay their dues. Each new applicant shall apply on a form approved and prescribed by the Board of Directors. The form shall request and the applicant shall provide name(s), address and any other information required by the Board of Directors. The completed form shall be submitted to the Corresponding Secretary, along with payment of dues for the current fiscal year of the Club. In addition to the application, the prospective Individual Member shall attend not less than one meeting of the Club prior to submitting the application. Upon receipt of the application, the Corresponding Secretary shall transmit the application to the Board of Directors. The application shall be read at the next meeting of the Board following receipt. After the applicant has fulfilled the prerequisites of membership, the applicant shall appear before the Board. The Board shall make a recommendation to the membership concerning the application, and the membership shall vote on the application at the next general meeting of the members. The applicant shall appear at said meeting, and the application must be approved by a vote of not less that two-thirds (2/3) of the members present. The vote may be by secret, written ballot. In addition to the above stated requirements, any person who operates a professional kennel or is engaged in the breeding of dogs and the sale of puppies, shall upon request of the Board, submit to an inspection of the kennel or other premises by the Board or its designated representative. Anything herein to the contrary notwithstanding, the Board may waive those provisions of the Article as it deems justified in individual circumstances. Membership may be terminated by: resignation by a member in good standing by writing directed to the Corresponding Secretary of the Club, lapse of membership, which occurs upon non-payment of dues or expulsion of a member in accordance with Article VIII of the Bylaws. Ready to join? Here’s the Membership Application form [PDF], which may be filled out online, printed, and mailed to the address on the form once all signatures have been obtained. 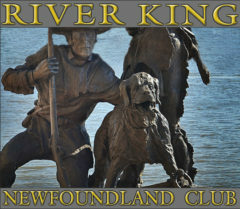 If you don’t know any current members of the River King Newf Club, check out our sponsorship page. If you have any questions, please consult the RKNC Board Members List and send your inquiries to the President.